People who specialize in a belief or practice tend to develop “code language.” The specialized vocabulary of medical professionals and the law are two common examples, but the same is true for construction workers, baseball players and those who cook. Likewise, Christianity has developed specialized words which serve as shortcuts for those who understand their meaning- grace, liturgy, eschatology, justification, Trinity, redemption… words which are helpful, but aren’t a normal part of our everyday vocabulary. 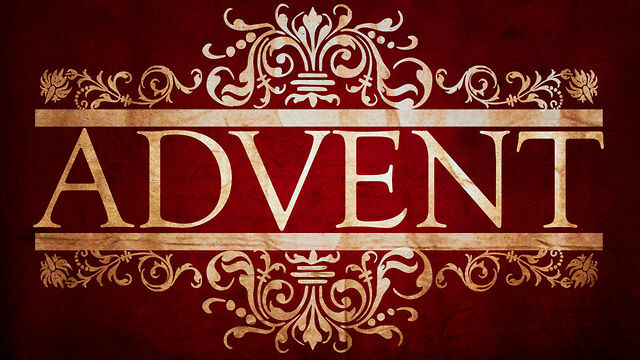 Advent means “to come.” During this season we prepare for three advents. The first is the coming of Jesus two thousand years ago. We remember the faithful people who waited and watched for God’s promised Messiah: Abraham and Sarah, moses, Miriam, and Aaron, David the king, Isaiah the prophet, Elizabeth and Zechariah, Simeon, Anna, and many more. They lived by faith, holding fast to God’s promise. The second advent is the coming of Christ among us now. Every day is an advent because Jesus is Emmanuel, God-always-with-us. Christ comes to us in the waters of baptism, with the bread and wine of his holy meal, through the word of God, and in the community of faith. Christ surprises us by coming at the times, in the places, and through the people we least expect, startling us with grace and bringing us new life. The third and final advent is yet to come. No one knows the day or the hour. Christ will come at the end of time, gathering God’s beloved people into one embrace and mending with mercy what sin has torn apart. As with the coming of Christmas Day, we cannot make it happen sooner because we are eager, nor can we delay it because we are not ready. However, we can be awake and alert, standing on tiptoe, wide-eyed and watchful, ready to receive him whenever he comes. I’m looking for a different Christmas experience this year- one with Christ at its center and space for reflection. I’ve been worshipping Christ for years; it’s the space for reflection part that eludes me. I knew I would need help pursuing this quest and my friend Jan Richardson stepped right up without even knowing it. She just published a new e-book entitled Through the Advent Door: Entering a Contemplative Christmas [Kindle Edition]. It’s structured in the style of a classic Advent calendar, with twenty five scripture reflections, each with an original piece of art. PS- You might be asking, where did these readings come from? Mary and company don’t appear until Door 19. For her book, Jan uses the classic Advent readings from the Revised Common Lectionary. The Revised Common Lectionary is a three year cycle of weekly Bible readings. Each weekly reading contains four Scripture readings: one from the Old Testament, one from the Book of Psalms, one from the Gospels (the first four books of the New Testament), and one from the Epistles (basically the rest of the New Testament). If you desire to seek the presence of God in your life, be silent and rest in prayer. Only through this interior quiet can you truly listen for Jesus. Why is silence necessary for listening, and what happens when we enter into the silence of solitary prayer? We begin to let go of ourselves, which allows us to hear God. God is very gracious and patient. God does not usually interrupt us or push rudely into our affairs. If we choose to ignore God, God allows that. Such is the humility of a God who died on a cross. Therefore if we wish to pray – and by this I mean open ourselves up to the possibility that God will speak to us, teach us, transform us – we must allow space in the busy world we have created. Like the ones who went into the desert, we must go to a place where the world does not overwhelm us. Deprivation is neither the focus nor the final word of the wilderness. As the honey-eating John knew, the desert offers its own delights. What the wilderness gives us is a path that helps us perceive where our true treasure lies. And does not merely give us a path: empties us enough so that a path is made within us. Through us. Of us. A road for the holy to enter the world. A way for the Christ who comes. where God will find us and we can find God. Solitude is the furnace of transformation. 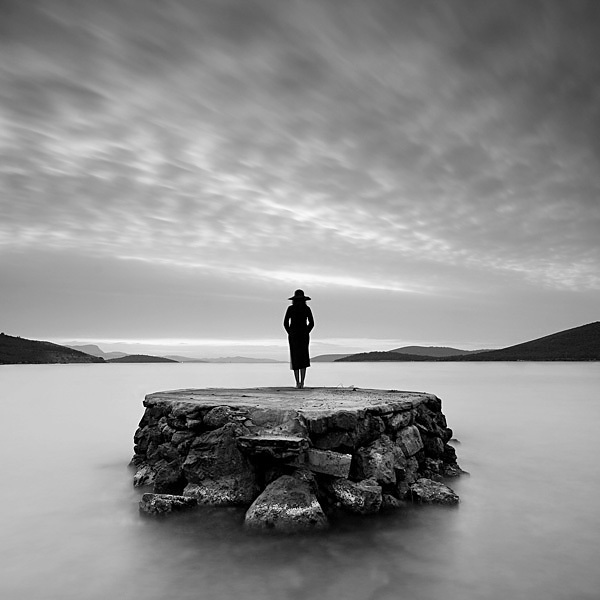 Without solitude we remain victims of our society and continue to be entangled in the illusions of the false self. We have, indeed, to fashion our own desert where we can withdraw every day, shake off our compulsions, and dwell in the gentle healing presence of our Lord. 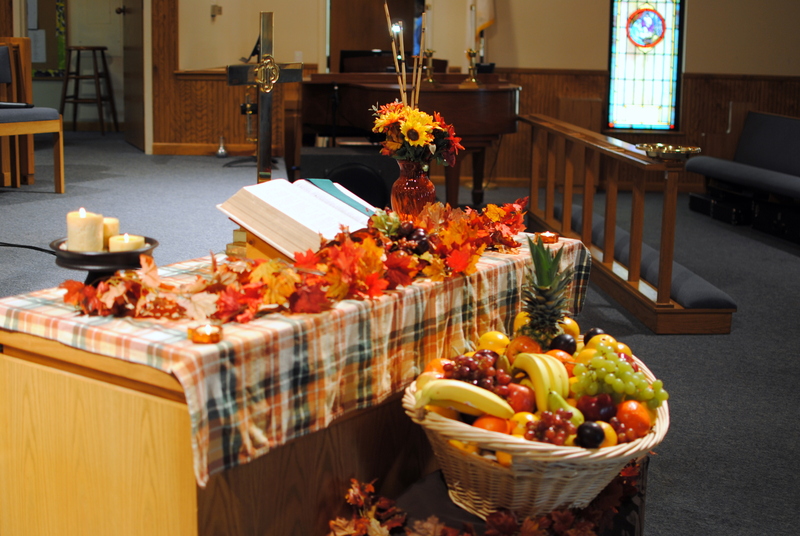 2011 Thanksgiving altar table display by Kim Evans for Community United Methodist Church in Debary, FL. For centuries, Christians have been reading scripture, followed by a time of reflection and prayer. This year, I found the following scripture especially poignant for Thanksgiving Day. I pray it will draw you into a deep time with our Lord, the One who so faithful provides. Happy Thanksgiving! For the Lord your God is bringing you into a good land, a land with flowing streams, with springs and underground waters welling up in valleys and hills, a land of wheat and barley, of vines and fig trees and pomegranates, a land of olive trees and honey, a land where you may eat bread without scarcity, where you will lack nothing, a land whose stones are iron and from whose hills you may mine copper. You shall eat your fill and bless the Lord your God for the good land that he has given you. Take a moment to name God’s blessing and provision in your life. When have you neglected to thank God or give God credit? What steps will you take to correct this? Close with a prayer of confession and thanksgiving. For more information on the scripture translation, art and the use of this devotional in other settings, please refer to the copyright information page. Before his ascension, Jesus instructs the disciples to go back to Jerusalem and pray for the coming of the Holy Spirit. 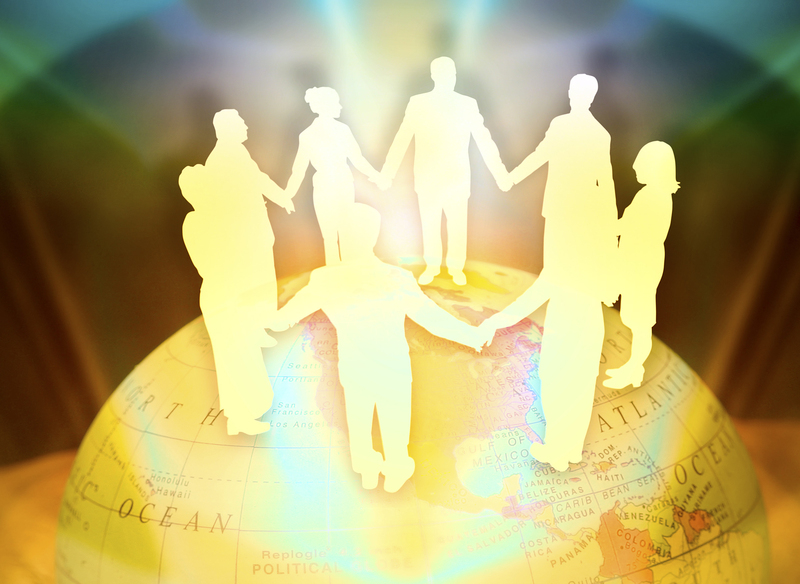 (Acts 1) The disciples prayed for nine days and on the tenth day received the Spirit’s empowerment, boldness and wisdom for the next chapter in God’s mighty acts of salvation. (Acts 2) Down through the ages, Christians have followed this same pattern of intense prayer and preparation before entering their next chapter with God. Below you will find a prayer and scripture schedule for the nine days leading up to a decision making meeting or retreat. This prayer vigil was originally designed for congregations entering into a time of visioning, but can be used at other times as well. Whatever your need, I pray it is useful to you as you seek God with the others in your congregation. • What is God calling us to do and what is God calling us to stop doing? • Where is God calling us to go? • Who is God calling us to serve? You are welcome to use this work in your setting with proper attribution. Please contact Lisa for information and permission to publish this compilation in any form. For more information on the art used in this work, please refer to the copyright information page. Mark 14:1-9 The unnamed woman who blesses and anoints Jesus a few days before his death, teaches us three important things about worshipping fully. Worship is a response to who Jesus is and what he has done for us. They know each other but we don’t know how. Had Jesus healed her? Did she hear his teaching a decide to follow? What we do know is that she dares to touch him. She comes close. She is totally focused on Jesus. Her goal is to bless him. She is looking for nothing in return. She is intimate, yet her actions are reverent, full of respect. She models the right balance. Intimacy needs reverence or its just gushy emotion. Reverence needs intimacy or worship becomes cold, mechanical and detached. Worship is about outpouring, overflow. It’s Miriam and the women celebrating the liberation of the slaves with tambourines and singing. It’s David dancing in the street with abandon as the Ark of the Covenant is finally safe and in the midst of the city so all may come and worship. It’s the woman breaking into the party and breaking into the circle where Jesus was seated. Crack. Shatter. She boldly breaks open the alabaster jar, pouring out the perfume, her heart, her adoration, her passion, her gratitude. Those gathered are going to see it, hear it, and smell it. She holds nothing back. She makes no excuses. She is focused on blessing Jesus, not what others might say. Worship is more than just what we can get from God. Yes we received when we worship, but to worship fully we must focus on giving to God, blessing God, adoring God. In the ancient world you didn’t show up to worship without a sacrifice- an animal, a drink offering, or a grain offering. Your motivation for the offering was also critical to acceptable worship. Worship isn’t consumer driven. From a consumer perspective, true worship is an impractical, extravagant “waste” of time, energy and resources. The alabaster jar was full of very expensive, rare perfume. The woman does all that she can. She gives her best; her most prized possession. The onlookers say it’s a waste- throwing away her time and money. Jesus says no- it is a beautiful thing and it will be remembered. What am I bringing to worship as an offering and blessing to Christ? Our love for God is tested by the question of whether we seek Him or His gifts. Glorious One, heal our stingy, greedy ways. Teach us to worship you with abandon. Unashamed and alive with praise. through Christ Jesus our Lord. Amen. Touching Him in his distressing disguise. If believers in God don’t honor the cries and claims of the poor, we don’t honor him, whatever we profess, because we hide his beauty from the eyes of the world. Click here for a reflection entitled Samaritan, by Steve Garnaas-Holmes. It’s an incredibly beautiful and challenging reminder of how the rich and poor need one another and heal one another. Do justly, now. Love mercy, now. Walk humbly, now. You are not obligated to complete the work, but neither are you free to abandon it. I’m wary of faith outside of actions. I’m wary of religiosity that ignores the wider world. Look, whatever thoughts you have about God, who He is or if He exists, most will agree that if there is a God, He has a special place for the poor. In fact, the poor are where God lives. Check Judaism. Check Islam. Check pretty much anyone. I mean, God may well be with us in our mansions on the hill… I hope so. He may well be with us as in all manner of controversial stuff… maybe, maybe not… But the one thing we can all agree, all faiths and ideologies, is that God is with the vulnerable and poor. God is in the slums, in the cardboard boxes where the poor play house… God is in the silence of a mother who has infected her child with a virus that will end both their lives… God is in the cries heard under the rubble of war… God is in the debris of wasted opportunity and lives, and God is with us if we are with them. And I`ll follow you into the homes that are broken. Follow you into the world. Meet the needs for the poor and the needy God. How does God’s love abide in anyone who has the world’s goods and sees a brother or sister in need and yet refuses help? Little children, let us love, not in word or speech, but in truth and action. 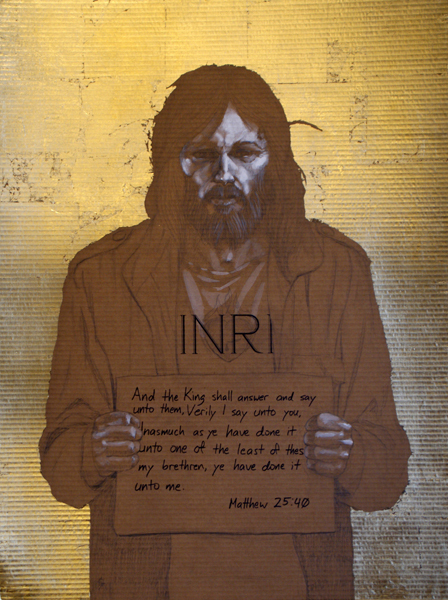 For more information on the scripture translations, art, lyrics and their use in other settings, please refer to the copyright information page.